El Pollo Loco adds three new faces to their Under-500 Calories menu including new Lettuce Tacos. 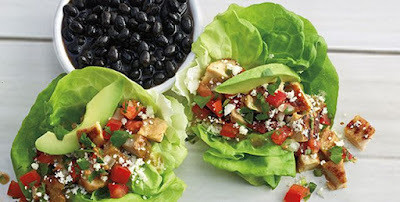 - Lettuce Tacos (380 calories) - Two lettuce cups filled with flame-grilled chicken, avocado, poblano salsa, cotija cheese, cilantro, and pico de gallo. A small side of black beans is also included. - Open-Faced Tostadas (500 calories) - Two tostada shells topped with grilled chicken, guacamole, pico de gallo salsa and cotija cheese. - Skinny Fajita Quesadilla (470 calories) - Flame-grilled chicken, fajita vegetables, poblano salsa, and melted cheese folded into a wheat tortilla.